we are tinushan & kamalesh from bandarawella ,gayans textiles. your program is verry sweet. we want good song for our staf. hi anna kavy from mallakam. 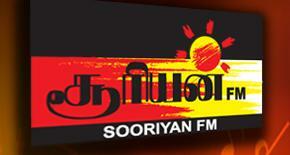 i’m enjoing sooriyan fm from doha qatar and i’m very happy to listen sooriyan fm online. hi anna very gud morning to u all. im tharshini from uk. thank you so much i very like online radios…tq.